The number of older New Yorkers who fall and suffer serious and deadly injuries is on the rise, but there are programs in across the state meant to help people avoid the dangers of a fall. 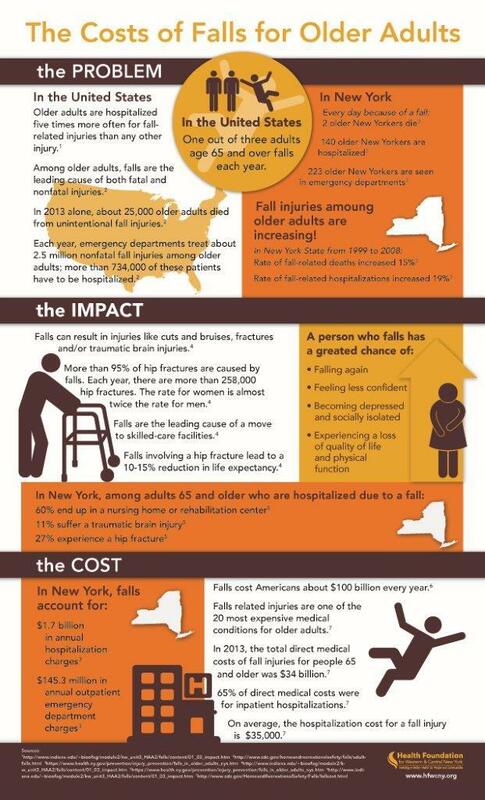 The latest statistics on the number of falls among older New Yorkers is a reflection of the growing elderly population in New York state, according to Amber Slichta, interim president for the Health Foundation of Western and Central New York. “Falls related deaths have increased by 15 percent, and falls related hospitalizations have increased by 19 percent,” said Slichta. Slichta says falls leads more people going into nursing homes or rehabilitation centers. The total cost for those stays nationally is $100 billion. To fight this, Slichta says prevention is key. It can be as simple as a home assessment, checking for slippery rugs or moving pots and pans to a lower location, to taking stock of what medications can make people dizzy, and more prone to falling. Slichta also says there are exercise programs which help seniors with their balance, one of the most popular, is Tai Chi. Anyone who wants more information can visit the Health Foundation’s website. Syracuse's Upstate Medical University is taking a research project into the community, which will focus on older, frail adults. Dr. Sharon Brangman, chief of geriatric medicine, says usually researchers start out with a thesis and then try to prove it. Armed with a $15,000 federal grant, they’ll work the other way around on this.